Fun Math Card Games That Help Kids Learn And Enjoy Math! Math Card Games make math FUN AND EXCITING while helping build important math skills.Helping kids become successful math students is easier when they enjoy learning math! Whether your child is doing addition, subtraction, multiplication, or division, there are math card games that kids will love and help improve their math skills at the same time! 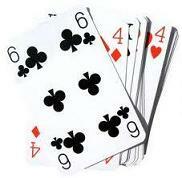 Have one of the players shuffle the cards and then deal six cards face down to each player. Place the rest of the deck of cards face down in the middle of the players. The goal is to get three matching cards (cards that show the same number of tenths). Players take turns drawing the top card from the pile and discarding one card from their hand. Students should name the discarded card, then place it face down under the pile. The first player to get three matching cards showing three different representations wins the game. The winning player should name the cards and then reveal them to the other player for verification. Increase the length of the game by asking the players to get rid of all their cards instead of letting the first match win. Ask that the winning player get four matches instead of three (four different representations). Check out some more fun math card games below, but be sure to check out the main math card game page. Remove all face cards from the deck. Let the players know that the Aces are worth one. Have someone deal 12 cards to each player. You can roll a die to decide who goes first. The first player tries to find combinations of cards that add up to 10. Each player tries to find as many combinations of numbers that add up to 10. Whoever finds the most combinations wins that round. Play three different versions of this game to get practice with place value, addition, or subtraction. Hi-Lo" can be played as an addition, subtraction or multiplication game. Division is also possible, but may be more difficult for younger students. Remove all face cards from the deck and place the entire deck face down in center of table. Each player draws two cards from the top of the deck. Addition version The two cards are added together. The highest number takes all of the cards. Subtraction version Players takes the higher number of the two cards and then subtract the lower-numbered card. In this case, the lowest number wins all of the cards. Multiplication version Played the same way as the addition game, except that the two numbers are multiplied together. In the event that two or more players have the same sum, difference or product, those players engage in a tiebreaker, where each player draws two more cards. At that point, the winner takes all cards from the initial round and the tiebreaker round. Math takes practice and at times can be hard. Playing math games takes the hard work out of practicing as well as learning new math skills. You might also want to check out some of these fun math card tricks that kids seem to really enjoy!